Chapter I: Uniform Algebras. Spectrum of an Algebra Element. Linear Multiplicative Functionals. Maximal Ideals. Some Examples. Shilov Boundary. Chapter II: &Ggr;-Analytic Functions in the Big-Plane. Generalized-analytic Functions. &Ggr;-analytic Functions on the Big-disc. The Big-disc Algebra. Boundary Behavior in the Big-disc. Algebras of &Ggr;v-analytic Functions. &Ggr;-entire Functions. Spectral Mappings of Semigroups. The Algebra HG∞. Algebras between HG∞ and LG∞. Appendix. Analytic Measures. Chapter III: n-Tuple Shilov Boundaries. n-tuple Boundaries of Uniform Algebras. n-tuple Boundaries of Function Spaces. Properties of n-tuple Shilov Boundaries. Shilov Boundaries of Tensor Products. Multi-tuple Hulls. Chapter IV: Analytic Structures in Uniform Algebra Spectra. n-dimensional Manifolds in Spectra. Big-manifolds in Algebra Spectra. Almost Periodic and &Ggr;-analytic Structures. References. Index. 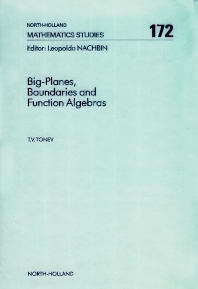 Treated in this volume are selected topics in analytic &Ggr;-almost-periodic functions and their representations as &Ggr;-analytic functions in the big-plane; n-tuple Shilov boundaries of function spaces, minimal norm principle for vector-valued functions and their applications in the study of vector-valued functions and n-tuple polynomial and rational hulls. Applications to the problem of existence of n-dimensional complex analytic structures, analytic &Ggr;-almost-periodic structures and structures of &Ggr;-analytic big-manifolds respectively in commutative Banach algebra spectra are also discussed.